Above: A map showing the City of Westminster (in PINK with a RED boundary). At the top of the map are the boundaries of the old Metropolitan Boroughs of Paddington and St Marylebone. Encompassed by a YELLOW line is the old Metropolitan Borough of Westminster (then called the City of Westminster). Additional YELLOW lines show the boundaries of the five areas of study used by the author to describe its history. This year, the part of the City of Westminster that we are looking at is the area of Piccadilly. Westminster is a London Borough, along with others like Camden and Islington. In the case of Camden, it is called ‘the London Borough of Camden’ and so you could call Westminster ‘the London Borough of Westminster’. For historical reasons this particular London Borough is known as ‘the City of Westminster’. As a short history lesson, it may be helpful to mention that what we call Westminster was part of a very large piece of land called the Manor of Westminster, administered by the monks at the building now better known as Westminster Abbey. The Abbey was closed in the 1530s – at the time of the Dissolution of the Monasteries. That meant that any administration of the land was, at a stroke swept away. It was not until 1585 that a court of burgesses (the Westminster Court of Burgesses) was formed to govern the Westminster area – particularly around the Abbey and as far east as the Strand. An Act of Parliament declared the land to be the ‘City of Westminster’ – a title it has taken care to preserve ever since. When studying any subject it is always easier if it is broken down into small manageable sections. The author has divided the whole of the London Borough (called the City of Westminster) into small areas of study. They are not related to any particular boundary but they have been designed to make it easy to present the history of each area. These divisions have been entirely defined by the author. In 1899 the ‘Metropolitan Borough of Westminster’ was formed. That should have been its name but, for the historical reasons mentioned above, it was called the ‘City of Westminster’. On the above map, its outline included all of the area shown with YELLOW boundaries. In 1965, the Metropolitan Borough of Paddington and the Metropolitan Borough of St Marylebone were added to the area in YELLOW to form what should have been called the ‘London Borough of Westminster’. Once again, for historical reasons, the larger area (shown in PINK on the Google map) is called the ‘City of Westminster’. It will be noted that, confusingly, there have been two pieces of land since 1899 that have been known as the ‘City of Westminster’. Returning to the subject of the ‘Metropolitan Borough of Westminster’ this had 12 wards which were created around 1900 for administrative purposes. They had no historical reasons for their boundaries. Being only interested in the historical aspects of the land, the author has decided to dispense with the actual ward boundaries and to divide the land up into areas that make sense from a historical perspective. As can be seen, the YELLOW area has been divided into five parts in order to study its history. This academic year we take a look at the area of study labelled ‘Piccadilly’. 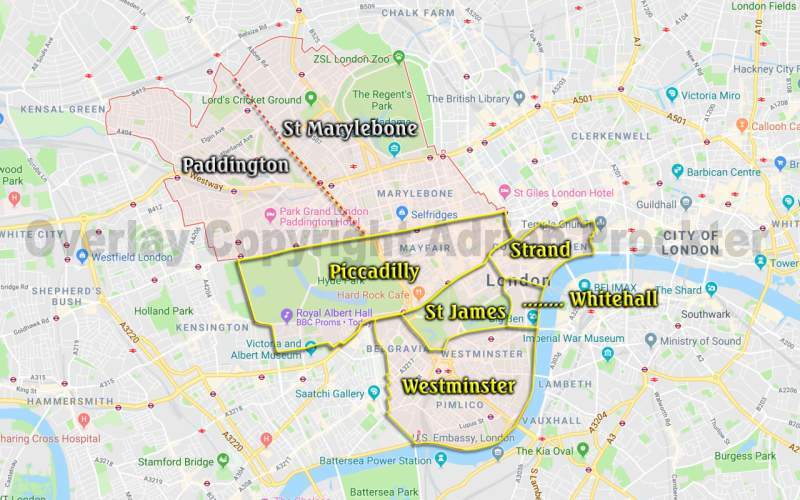 The area of study called ‘Piccadilly’ relates to the whole of Hyde Park, most of Kensington Gardens (which, in spite of its name, is within the City of Westminster). The areas covered by streets include Knightsbridge, Soho and Mayfair. Having taken a look at part of the City of London in the autumn term (which we do every year), in the spring term we return to the study schedule of part of the City of Westminster. The next few weeks we will spend looking at the area of study (defined by the author) called Piccadilly – deriving its name from the street known as Piccadilly and from the famous Piccadilly Circus. This entry was posted in /Wes-City of, 4-Comment. Bookmark the permalink.